Many hotels have stunning beachfront options. 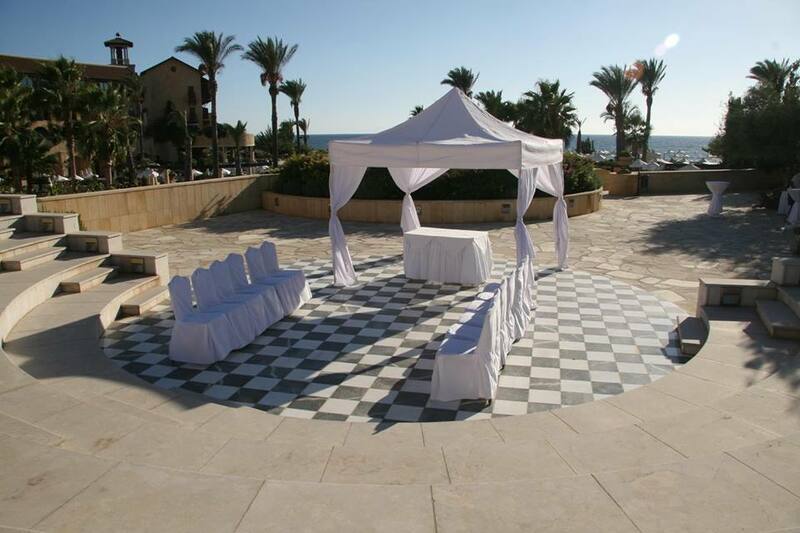 It is important to know that ceremonies are by law not actually allowed on the beach so you will need to choose from one of many hotels that hold ceremonies on their grounds offering Gazebos and terraces overlooking the beach and in some cases, a stone’s throw from the sea. Lots of choices are available and we can advise on the best venues in wonderful locations. Hopefully we can help here, so that the day suits the couple’s wishes perfectly. We can’t feature all the hotels available so please do contact us for more information on Hotel Weddings in Paphos. 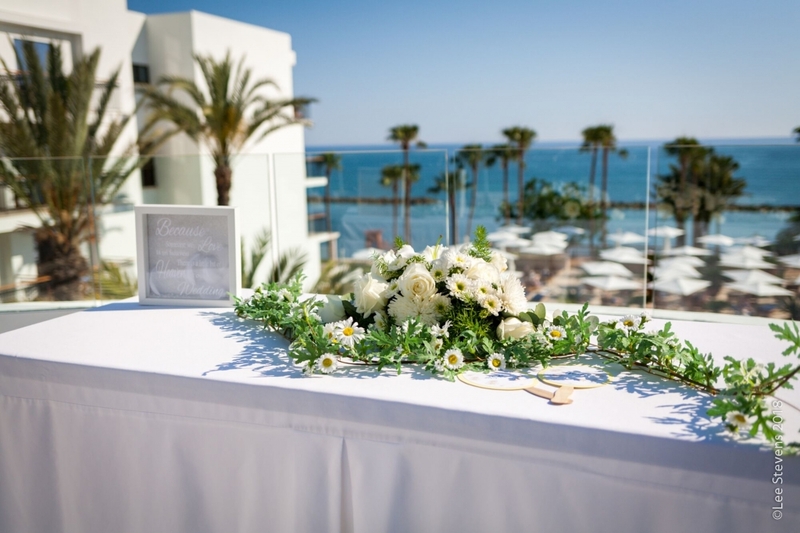 The Alexander the great hotel; offering their infinity terrace with its spectacular views of the Mediterranean, the beautiful Paphos castle in the back-drop and amazing place to exchange your vows. This very elegant hotel is within walking distance to shops, restaurants and the Paphos harbour tourist area. Corinthian terrace – This spacious veranda affords an enchanting view of the sea and the harbour right down to the medieval castle. This romantic and stylish new venue is simply stunning. After your wedding ceremony and cocktail reception you can choose to have your wedding breakfast in the adjoining banquet hall or one of 3 other venues at this hotel. Prices here are very competitive which makes this a popular choice for wedding days; civil wedding and reception can follow. Offering full privacy and a one wedding per day policy. For more info contact us. This 5 star luxurious and extremely stylish hotel also known as one of the best hotels in the Mediterranean – 5 stars all the way. For those that want classic and elegant wedding day. The hotel has a number of rules – you must stay at the Elysium hotel for 5 days at least. Your wedding cake must be in-house. You can choose from in-door or out-door reception venue. Most popular choices for the wedding ceremonies are their Amphitheatre or the small chapel. The hotel is situated just off the Tomb of the Kings Road – not too far travel for the harbour tourist area. This hotel has some stunning rooms and the pool areas are divine. Not the cheapest, but if your budget can stretch to it – an amazing wedding venue choice. This is an extremely popular wedding venue – it is very affordable and offers a number of beach side choices for both your civil wedding ceremony and wedding reception. For those that would like a religious ceremony, The Kefalos has its own chapel where you may have either a Catholic or Anglican wedding ceremony. You may decide to stay at the Kefalos Beach holiday village – although this venue is self catering; there are bars, restaurants and pools in the main building available for the guests your use – this is located jus of the Tomb of the Kings Road; within walking distance to shops, bars and restaurants. Overlooking the Mediterranean – Sea and close to the shores where the goddess of love immerged from the sea waves, you will find an exclusive Venue with beautifully landscaped lush gardens, unique architecture modelled on a traditional village complemented by astonishing dining experiences ranging from a local Taverna to elegant fine dining. Individuality, innovation and personalised service are the key factors for the success of every event. It is the resorts aim to exceed our guest’s expectations, always striving to excel in creative presentation impeccable service and exceptional food – quality, from the ceremony at the Chapel, to the cocktail reception and gala dinner. For overseas or local weddings the luxurious and picturesque resort is truly the Ideal location. The Annabelle is a high standard hotel with a relaxed feel that we are more than happy to recommend it for both accommodation and as the venue for your special day. Offering simple luxury and elegance to enhance any wedding day! Situated right in the heart of Paphos with the med-evil castle as its back-drop; with its glorious views, understated design and elegance, combined with 5 star luxury and service, makes this an excellent choice if you are looking for something more sophisticated and extra special. Look no further than this five star hotel; recognized as one of the top leading world hotel. 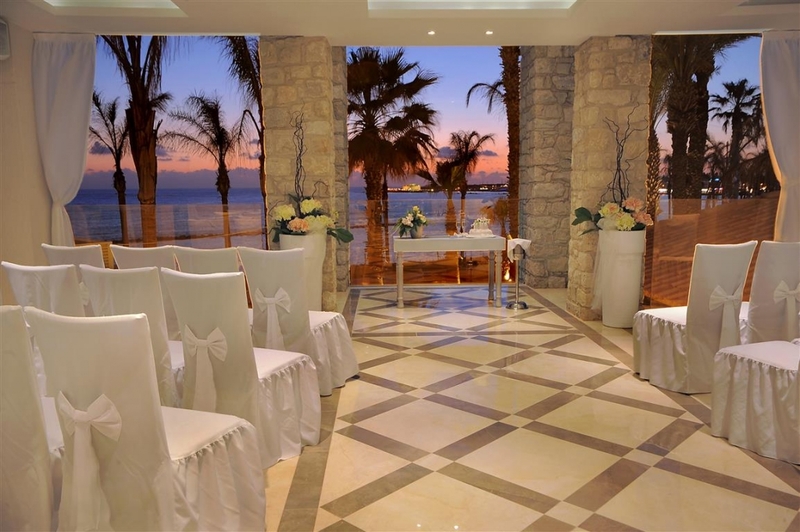 If is magical views and a wonderful setting for both your Cyprus wedding ceremony and wedding reception that you are looking for, then this hotel, with its ‘one wedding per day’ policy; warmth and extremely good service is a great choice for your Cyprus Dream Wedding Day. This hotel require that you are resident for a minimum of 3 nights when having your ceremony at the hotel plus compulsory wedding reception meal must also be held at the hotel. 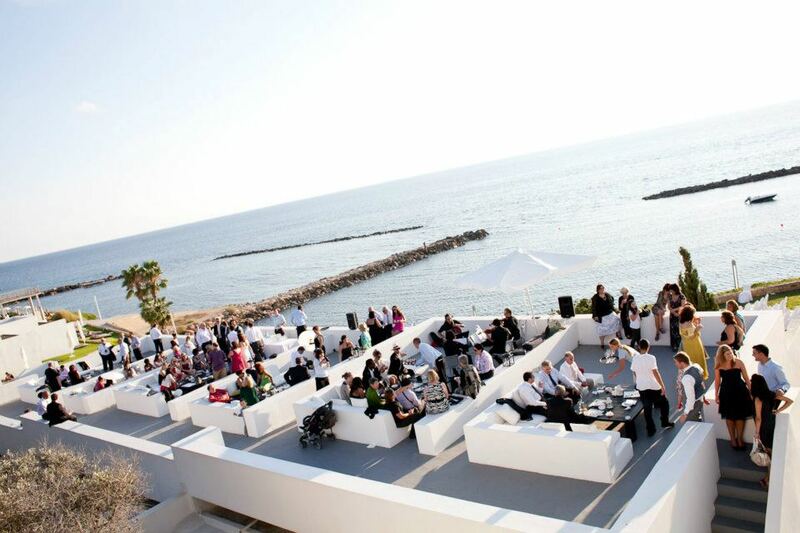 A venue that is more on the “lavish side” is the Almyra Hotel in Paphos. This modern and stylish 5 star hotel is genuinely a fabulous choice for your ceremony and reception venue and will offer an element of privacy along with guaranteeing only one wedding a day. 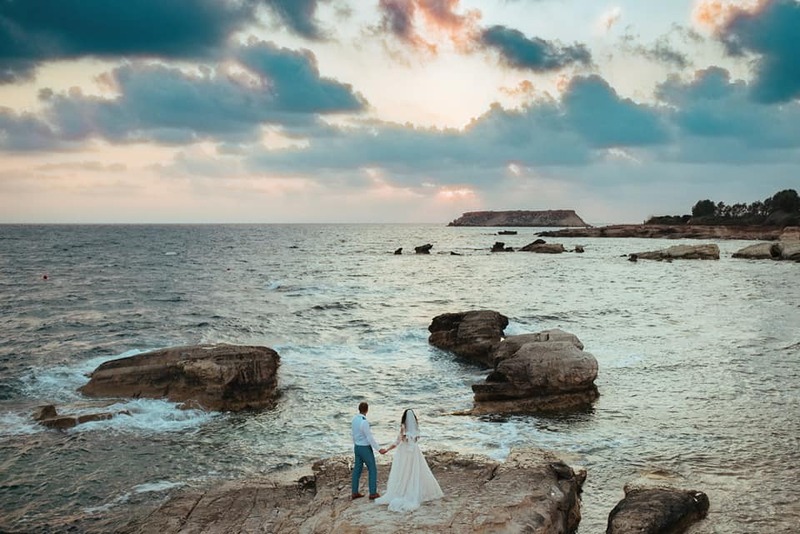 Well situated in the tourist area, with the Paphos Castle and Harbour as its back-drop; offering fabulous photo opportunities for your wedding day. Offering Fine dining, attentive, but discreet service and always paying attention to detail. This hotel is happy to cater to all your requirements and taste to suit your specific needs. 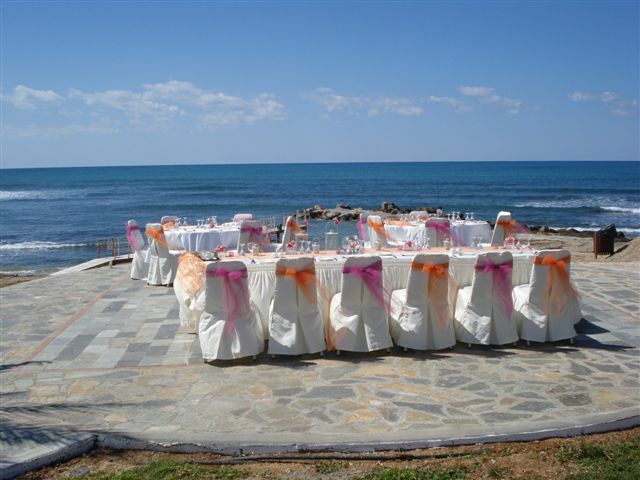 No matter the size of your wedding party; rest assured that if its luxury and attention to detail you require; then this venue will be the perfect location for your Cyprus Beach Wedding day. This hotel require that you are resident for a minimum of 2 nights when having your ceremony at the hotel plus compulsory wedding reception meal must also be held at the hotel. The Leonardo Laura Beach Hotel, an oasis of tranquility and relaxation. It’s located on the sea front just a few kilometers from Paphos Harbor. 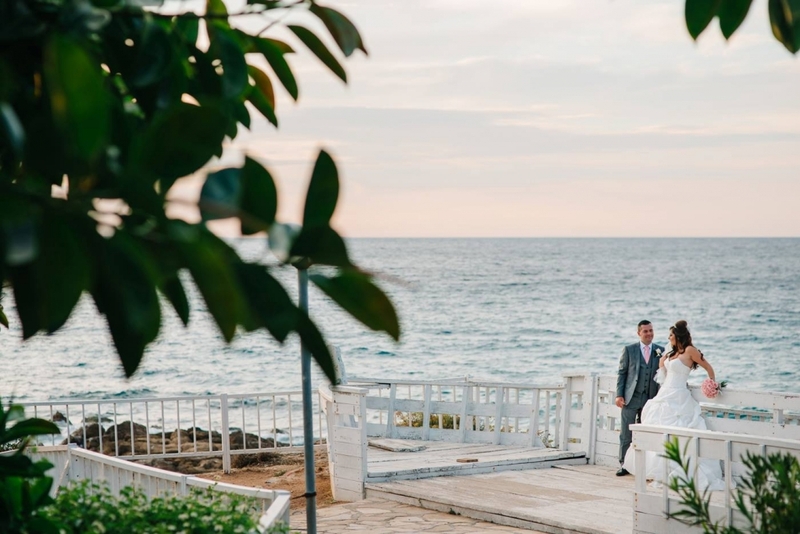 the hotel is one of the few Paphos hotels with a west-facing outlook that provides guests with a sublime view of blazing indescribable sunsets perfect for your wedding photos. This recently refurbished hotel with brand new water park is an AI hotel which has the First Choice Splash world for kids, so offers fantastic facilities aimed at kids of all ages. The hotel banqueting team is at your disposal to present a selection of menus for cocktail receptions, intimate family meals, gala dinners or buffets. Each menu can be personalized to accommodate your individual preferences. To make your dreams come true, our friendly and professional staff will organize the perfect day for you, ensuring that your wedding will be full of memories to be treasured for a lifetime. A friendly environment of casual luxury by the sea, and to make your holiday an experience that you will want to repeat. This exciting new resort offers a stunning location for your wedding ceremony and reception. Cap St Georges Beach Club Resort is the perfect place to lie back, switch off and relax, but it’s also the perfect place to tie the knot so no matter the size of your wedding party Cap St Georges Beach Club twill take care of your every wish. The clubhouse provides all the services of a five-star hotel, without actually being a hotel. Thanks to its west-facing position, Cap St Georges clubhouse enjoys spectacular sunsets and panoramas — views maximised by the villas’ design. The area’s sea caves and pure waters of Paphos make it one of the most idyllic stretches of the Mediterranean coast, perfect for swimming and diving. The nearby islet of St George, the only island off Western Cyprus, is within easy swimming distance and attracts historians as well as romantics: Cleopatra is said to have prayed here. Cap St George’s clubhouse is the perfect place to lie back, switch off and relax. But those with a desire for more activity are equally well served: swimming and water sports such as windsurfing, scuba diving and kite surfing are a sheer indulgence in the tranquil blue sea while the more adventurous can head to the mountains for terrain that will delight mountain bikers, hikers, bird watchers, para-gliders and botanists alike. Your wedding should be a day that is anticipated with excitement, experienced with joy, and remembered always with great fondness. 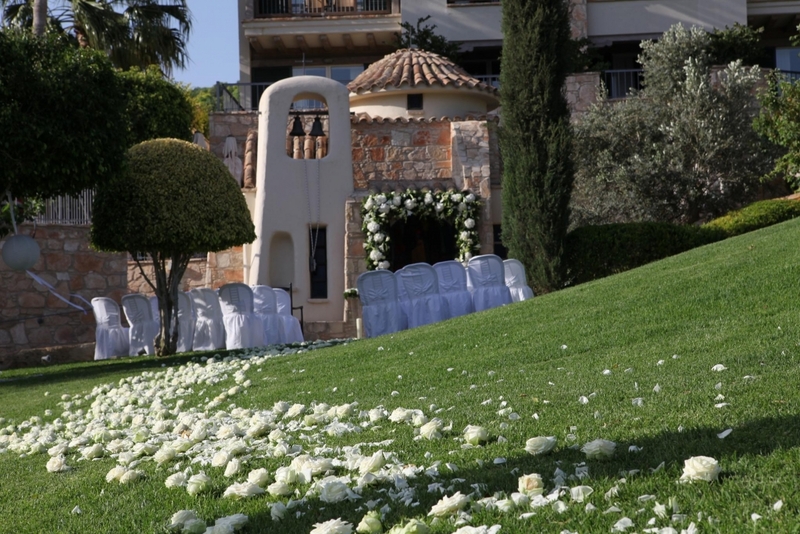 Here at the Cap St Georges Club House we offer a truly relaxing setting, with the glorious Mediterranean Sea acting as the perfect back drop for the ceremony. We do so want this to be a day which will be remembered for all the right reasons and here we ensure that in choosing the Cape St Georges Clubhouse for your celebration, you will be able to relax, and thoroughly enjoy the day, as we will take care of all the details ensuring family and friends relish this truly beautiful, intimate atmosphere. Receptions are held on the on the pool side terrace. This venue has a one wedding per day policy and music must end at 11 pm. Luxury accommodation is available on site at the club house or in one of the resorts luxury villas.